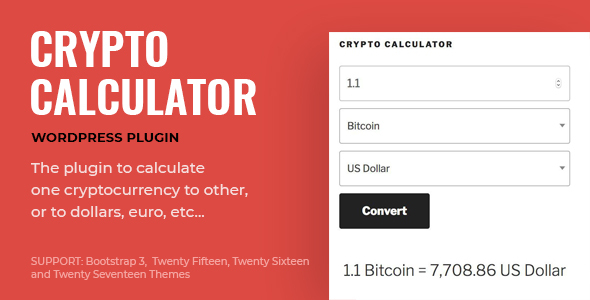 CryptoCalculator – is a plugin which displays the value of one cryptocurrency in the equivalent of another. We succeed to realize shortcode (enough easy in the setting) so, that you could use it not only on your page but also in the widget and from code in your theme. There no limits on the number of such shortcodes on one page. You can show 2 or more shortcodes on one page and this not is an error. There are supported more than 1300 Fiat Currencies and Cryptocurrencies. Always actual course, all requests are executed in the real-time schedule. Opportunity caching received data for faster access to it. Opportunity to create your own groups and to add some currency in it. Opportunity to use your WordPress site as API endpoint for getting conversion results from another place. Supporting standard themes such as Twenty Fifteen, Twenty Sixteen, and Twenty Seventeen. Integration from CryptoPulse WordPress Plugin for getting The Real-Time Market Capitalization information. Integration from Shape Shift WordPress Plugin for the opportunity exchange coins after getting information about conversion rate. We always glad to hear out you and to integrate your wishes in a future update. Do not hesitate to leave your suggestions in the comments. You can see online full documentation here. If you have any questions, you could bravely apply to support of this plugin and we will try to give an answer to your questions with pleasure.